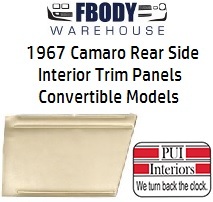 This is a pair of new replacement standard rear interior trim panels for use on 1967 Camaro with standard interior and CONVERTIBLE models only. Units are available in 5 different factory colors and these are the NON-assembled version which does not include the chrome like molding. Use the drop down menu to select the color you need. This is a pair of new replacement standard rear interior trim panels for use on 1967 Camaro with standard interior and CONVERTIBLE models only. With the top down these really stand out in your interior! Make your convertible looks it's best! Unite can ship to the USA and Canada only.